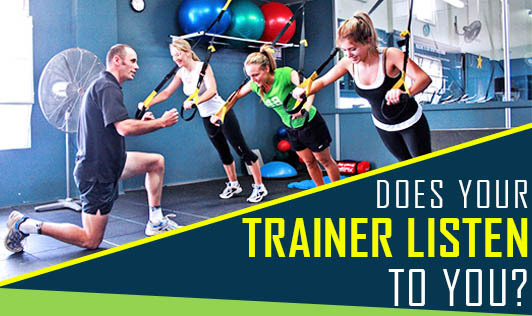 Does Your Trainer Listen To You? Hiring a personal trainer can be a great start for your fitness. You need not worry on choosing a perfect exercise routine that meets your fitness goals. Your trainer is all set to take over your fitness needs and show you the way to make fitness a religion. And the best thing is he won't let you cheat! But beware! All this can turn out risky when your trainer doesn't listen to you and pushes you to do more. You can end up with a severe injury! Identify the signs that indicate that it's time to change your trainer. Your questions are unanswered by your trainer: A good personal trainer will respond with suggestions and right advices. If he doesn't get back to you, then something could be wrong. Your trainer doesn't listen to you, when you say ‘no': Is your complaint of exhaustion and pain unattended to by your trainer? If he is pushing you through the pain, you may end up with serious injuries. Your trainer doesn't encourage you: Your trainer is the biggest cheer leader and should constantly encourage you to reach your goals. The lack of positive motivation from your trainer can make you feel like a failure. Your trainer is trying to sell you supplements: Unless your trainer is a qualified health professional, doctor or a nutritionist he should not promote any kind of supplements. They can turn out to be potential health hazards, when taken without medical supervision. Your trainer always seems distracted: You deserve to get undivided attention from your trainer when you are working with weights or on machines. If your personal trainer is indulging in chit chatting with others or is continuously over the phone with someone, then it is time to change your trainer. How to get a good personal trainer? Observe personal trainers at your gym: Observe trainers who are training people with common fitness goals. This will give you an idea about how he interacts with his clients. Get referrals and reviews of trainers from friends at your gym: Ask a friend at your gym to refer you to a good trainer who can help you reach your fitness goals. Take a trial exercise session: This will help you understand a typical training routine that you would be going through. A good personal trainer will discuss your fitness goals and exercise routine. Be reasonable while making your goals and take equal responsibility for your part of the program. Make sure you follow a healthy diet routine, take adequate rest, sleep sufficiently and hydrate yourself.